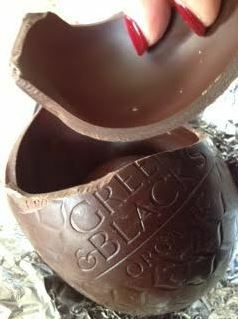 I was sent one of the absolutely delightful dark chocolate Easter eggs by Green & Black’s and after opening it my whole front room seemed filled with the smell of the rich dark chocolate. That Dominican Republic chocolate has gotten better since the investment in fermenting and training I feel. The rich dried red fruit flavour absolutely comes out in this egg which you won’t get with any other mass market egg I am aware of. It might not be fair to call Green & Black’s “mass market” despite the fact they are owned by Mondelez (formerly Kraft) and sold in supermarkets. In fact, I think the fact Divine and Green & Blacks are sold in the supermarket is absolutely brilliant because they are giving parents an ethical and safe choice for their Easter chocolate. The flavour of the egg is delightful and on a par with a lot of “artisan” chocolate in the market. The flavour of dried red cherries comes through a rich, deep chocolaty flavour without a hint of bitter. Dark chocolate should not be bitter if it is good quality and this is absolutely not bitter. 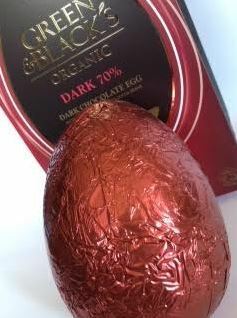 With no child slave labour, an investment in the local economy and a quality dark chocolate, this egg is the choice you should be making this Easter if you opt for Supermarket eggs. It has no plastic and it is thick. It is just foil and recyclable cardboard so environmentally friendly at the start and the finish. Me alegra que Green & Blacks cuide su producto , que es como cuidar a sus consumidores …. Gracias una vez mas por tu información.